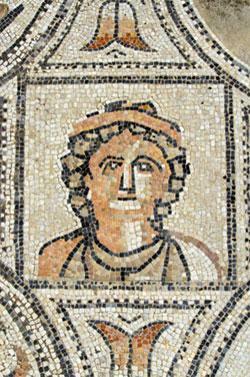 Intricate mosaics dating to 40 AD remain as footprints of Morocco’s early Roman occupation in the city of Volubilis near Meknes. The Romans built the city to keep control of this North African region which was successively occupied by the Greeks, Berbers, Jews and Carthaginian merchants. The country made famous by the Hollywood classic “Casablanca,” Morocco or the Kingdom of the West is an enchanting tourist destination at the junction of Africa and Europe. With an area of 172,413 square miles, Morocco is strategically located at the mouth of the Strait of Gibraltar, and is the only country that has direct access to the strait on the African side. As such, the nation forms an important part of the trade link between Africa and Europe. Having faced many challenges since its independence in 1956, the kingdom is now in the midst of steady economic development under King Mohammed VI, who assumed power in 1999. 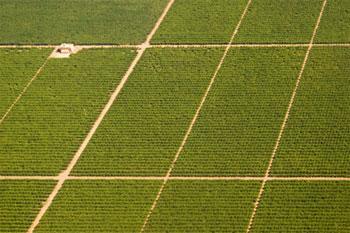 Although 40% of Morocco’s population depends on agriculture things are changing. In 2005, Morocco had the second-largest non-oil GDP in the Middle East. Foreign investments are also accelerating, with France remaining its primary creditor and foreign investor. Through the centuries, Morocco’s geographic advantage and natural resources remained a prime attraction for invaders such as the Phoenicians, Romans, Visigoths, Vandals, and Byzantine Greeks. Arabs ruled the country during the seventh century and it was they who introduced Islam to the Moroccans. Later, the Europeans competed with each other to gain control over the country and its huge deposits of phosphate rock, as well as other resources like coal, iron, lead, manganese, petroleum, silver, tin, and zinc. Finally, after a series of conflicts and reconciliations between the Europeans, Morocco became a protectorate of France. The country was allowed to retain its sovereign status under the king. The monarch continued to reign, but the real power stood with the French. Several nationalist political parties arose under the protectorate, and, subsequently, began a struggle for Independence during World War II. An important political party that took center stage during the nationalist movement was the Istiqlal (Independence) Party and Morocco benefited greatly from the leadership they provided. To this day, the party remains a preeminent political force. In 1953, the French exiled the king, Sultan Mohammed V, and replaced him with an unpopular leader Mohammed Ben Arafa. There were widespread protests against the action and, finally, Sultan Mohammed V was allowed to return to the country in 1955. Morocco gained independence in 1956. Morocco is currently a hereditary monarchy with a parliament and a multi-party political system. It is governed by a constitution promulgated in 1996. The monarch, who must be male according to the constitution, is the head of the state of Morocco. He appoints the prime minister and the cabinet, besides acting as the commander-in-chief of the country’s armed forces. A major issue simmering on the foreign affairs front is Morocco’s claim over the Western Sahara. After Spain gave up control in 1975, the territory was partitioned between Morocco and Mauritania in April 1976. When Mauritania, under pressure from Polisario guerrillas, abandoned all claims to its portion in August 1979, Morocco moved to occupy that sector and has since asserted administrative control over the whole area. However, the Polisario front of the Western Sahara has been demanding the formation of an independent state with support from Algeria. The issue has dragged on for more than 30 years now. The U.N. and the U.S. have tried to settle the matter but to no avail. Therefore, relations between Algeria and Morocco continue to be strained, acting as a barrier to regional development. Morocco has now begun to take special interest in renewable energy projects, as global warming and energy efficiency are some of the biggest concerns in the world today. Morocco is blessed with abundant sunshine and the country’s latest solar energy project, estimated at a cost of $9 billion, is aimed at providing 38% of the country’s electricity needs by 2020. Having been ruled by rulers of various ethnicities, the country has a multi-cultural identity. Morocco’s cultural palette has many colors — Arabian, French, Berber, and Jewish. All the cultures have contributed to the unique art and architecture of Morocco. Moroccan Arabic is the official language of the nation. French is also used in government offices and for conducting business. Islam is the national religion. In today’s Morocco, devotion to Islam and loyalty to the king are the cornerstones of national identity. Usually the language a Moroccan speaks decides his pecking order in society. Knowledge of French is a sign of sophistication and refinement, and speakers of Arabic too are shown respect. Those fluent in Berber are considered the lower strata of society. Clothes and headgear also act as symbols of status. The jellaba is a hooded single piece garment worn by both men and women. Turbans used by Berber men are often white while those of Arab men are orange. 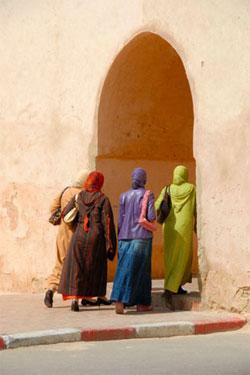 Tradition meets modernity, as four women dressed colorfully walk through a gate in Meknes Morocco. Initiatives taken by King Mohammed VI for social inclusion of women have paid off. Morocco’s population is 30.5 million and annual growth rate 1.2%. Life expectancy at birth is 70.7 years. The literacy rate is 51% for males and 42.5% for females. Gender bias is commonplace. Only 26% of the non-agricultural labor is female. However, the ratio of girls to boys in primary and secondary schools is reasonable at 87.9. Under the rule of Mohammed VI, the government has taken many initiatives to improve the status of women in society. For instance, the Moudawana 2003 code of law has greatly improved the family status code. It has given women the right to decisions on crucial issues like marriage, divorce, and custody of children in the case of remarriage/divorce. The code also dictates stringent rules for polygamy. The country is ranked 126 among 177 countries on the Human Development Index. Morocco, which was once an agrarian economy, has very strong secondary and tertiary sectors today. As of 2006, the services sector comprised of tourism, construction, and communications contributed 54.4% of the nation’s GDP. Manufacturing, mining, and energy accounted for 29%, while agriculture garnered the rest. Agriculture in Morocco is largely rain-fed. Farm output varies greatly from year to year because of erratic rainfall. However, 2006 was a good year for the country as economic growth leapt to 7.3% from 1.7% in 2005, mainly on the back of good agricultural production. Major products include barley, citrus fruits, vegetables, olives, livestock, and fish. In fact, fishing yields account for a good chunk of the country’s exports. The agricultural industry continues to employ 40% of Morocco’s workforce. The government has been encouraging development in the sector in various ways. For example, in April 2007, King Mohammed VI himself attended the second international agricultural fair in Meknes where new farming techniques were exhibited. Under a project called Green Plan Morocco, the government has decided to dedicate up to $2 billion per annum to fund 700 – 900 agricultural projects, a part of Morocco’s initiative to promote the agriculture sector’s competitiveness. Tourism is the main revenue contributor in the services sector. The government’s efforts to promote tourism seem to have paid off as foreign investment has been flowing into the segment steadily. Gulf developers alone have invested around $14 billion in the past ten years. 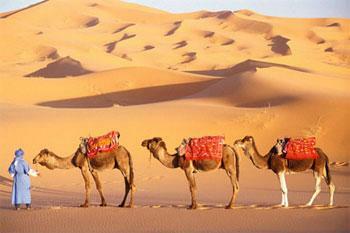 The number of tourists to Morocco has grown considerably over the years. 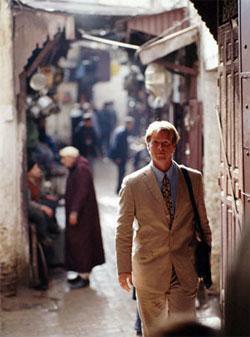 In 2006, nearly 5.8 million tourists visited Morocco, and tourist receipts increased 23.9% to $5.58 billion. In 2007, Morocco attracted a total of 7.4 million international tourists, registering a 15% rise in the first 11 months of the year, accounting for 8% of Morocco’s GDP. In 2009, roughly 8.3 million tourists entered the country. Tourism now contributes to 9% of the GDP, and in 2009, provided employment to 420,000 people. 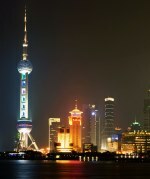 The country has a “Vision 2010” program, which aims to attract at least ten million tourists by 2010. 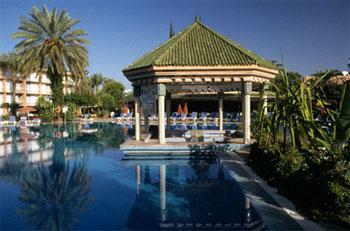 Tourism is Morroco’s second largest hard currency earner, a vital sector for the country. Over a decade, its contribution to GDP has grown from 8% to 20%. Although tourism development is mostly concentrated around popular tourist destinations like Casablanca, Marrakesh, and Tangiers, a largely unknown, underdeveloped region on the eastern, and arguably the nation’s most beautiful, coastline is gradually turning into what is going to be called Mediterrania-Saidia, the first of six coastal luxury resorts that are being built with the personal backing of King Mohammed VI. The other five are sprouting up on the Atlantic coast. The government is investing $4.4 billion in the six-resort project —Plan Azur Developments — to revive some of the nation’s poorest regions. Slated to be completed in 2010, Mediterrania-Saidia will be North Africa’s largest resort. It will flaunt 18-hole golf courses, a marina with 850 berths, a yacht club, ten luxury hotels with four- and five-star ratings, as well as 3,000 luxury apartments and villas. The resort is expected to attract 500,000 visitors by 2012. The information technology and communications sectors have been witnessing significant expansion as well. Morocco is the first country in North Africa to install a 3G network. If this didn’t prove a point, the number of Internet subscribers in the country jumped 73% in 2006 over the year-ago period. Further, a new offshore site at Casablanca, with state-of-the-art technologies and other incentives, has grabbed the attention of many global multinationals. 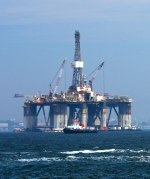 Setting up offshore service centers in the nation has become tempting. Such is the rate of growth, that off-shoring and IT activities are estimated to contribute $500 million to the country’s GDP and employ 30,000 people by 2015. The communications sector has already made its mark, accounting for half of all foreign direct investments Morocco received over the past five years. The construction and real estate sectors are also a part of the investment boom in the country. Increasing public investment in ports, housing development projects, and roads as well as the boom in the tourism sector have been a big shot in the arm for the construction sector. Construction grew by 8.6% in 2006 and 8.7% in 2007 due to large scale government building programs like housing, ports, tourist areas and infrastructure. The rise in construction activities and efforts to improve infrastructure are creating many opportunities for public-private partnerships. The real estate sector has also been seeing record investments. In fact, Morocco is being touted as the most popular retirement destination among Europeans, since it is inexpensive compared to other European tourist destinations. Most of the demand in Morocco is for moderate housing, and a decrease in lending rates has made home-ownership easier. Morocco has lured $13 billion in investments over the 2000-2006 period. The surge in FDI was driven by government policies which offered an attractive tax stimulus to investors. For a long time, the country’s expertise was limited to the fishing and food processing industries. Now Morocco is gradually moving into industries as diverse as aeronautics and textile production. However, the upcoming sectors are mostly fragmented and family-controlled, with limited resources and capabilities for research and development. Given that two-thirds of the world’s phosphate reserves are in Morocco, the chemicals sector, dominated by the production of phosphate by-products, contributes a third of the GDP. However, investment in the sector has stagnated over the years. Meanwhile, Morocco’s leather goods are making an appearance in Europe. These goods also enjoy duty-free entry into the U.S. market, thanks to the Free Trade Agreement (FTA). Being a moderate Arab state, Morocco enjoys cordial relations with Europe and the U.S. The country supports peace and cooperation in the African continent as well in as the Middle East. It has Free Trade Agreements with Egypt, Tunisia, and Jordan (Agadir Agreement) to promote inter-regional trade. The country also signed a free trade agreement with the U.S. in 2006, which resulted in the elimination of tariffs on 95% of trade in consumer and industrial products. The Central Bank of Morocco, Bank Al Maghrib, was granted enhanced autonomy in 2006. The bank, which follows the dual policy of controlling inflation and promoting growth, seems to be doing a good job. Morocco has largely had low levels of inflation. In 2006, its annual inflation was only 2.7%. The country’s GDP in 2006 stood at $ 57.3 billion. Exports rose but could not keep pace with the rise in imports. Hence, the trade deficit was 6.5% of GDP. But a large surplus in the services sector has enabled the country to maintain a positive current account balance. The main trading partners of Morocco are France, Spain, Italy, the U.K., and China. Morocco’s GDP rate growth slowed down to 2.1% in 2007 due to a drought that affected agricultural output, necessitating wheat imports at a time when food prices were regularly increasing. France has a major share in both imports and exports. The Casablanca Stock Exchange is Morocco’s main stock exchange. It started in 1929, but came into reckoning after financial reforms in 1993. Around 73 companies are listed on the exchange, but the market capitalization of the exchange is quite high compared to other markets. Market capitalization of the exchange in February 2008 was $8.468 billion. The government has taken several steps to encourage more companies to get listed on the bourse. When the global financial crisis hit the world, Morocco was remarkably resilient. The country’s prudence in the past came to the rescue. Strong macroeconomic policies, limited exposure to foreign financial markets, stringent banking supervision and sufficient international reserves ensured that Morocco’s problems were temporary. In the last three decades, Morocco’s economy has shown steady improvement and solidity. For instance, the gross national income per person has jumped up four times from $550 in the 1970s to $2,770 today. The country managed to post some good figures in 2008. Growth remained strong in the third quarter of 2008, expanding by 5.4%. What’s more, Morocco was voted as the Best Emerging Market Economy of 2008 based on Standard & Poor’s Global Broad Market Indices as its losses amounted to just 15.8% for the year 2008. But Morocco had no control over external markets. Sluggish foreign demand, a slump in tourism and paucity in workers’ remittances led to a slowdown in growth in the fourth quarter of 2008. At this point, for the first time since 2001, Morocco’s development rate did not go beyond 4.7%. 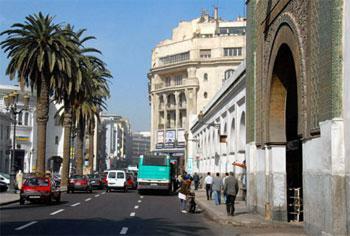 Tourism, which forms the biggest source of foreign revenue for Morocco, fell 21% in the first quarter of 2009. Trade too suffered heavily, especially with Europe one of its key markets, as consumers cut back spending and factories reduced output. But it did not take long for Morocco to bounce back. As consumer spending has shown active signs of life, the government expects overall growth to be 5% in 2010. Unemployment actually decreased to 9.6% in 2008 from 9.8% in 2007, and exports received a major boost with a $100 million grant from the European Union to promote exports and infrastructure. Tourism rebounded remarkably with a 6% spike for the year 2009 compared to 2008. Morocco expanded 5.8% during the fourth quarter in 2009, mostly due to a bumper wheat harvest, with farming still the primary occupation for 32 million people, accounting for 15% of the nation’s GDP. Challenges, though, still remain. One of the biggest tasks lying ahead for Morocco is reducing unemployment, which touched high levels of 9.8% in 2008. Although the jobless rate fell to 9.1% in 2009, due to growth in the service and construction industries, it still remains a worry. 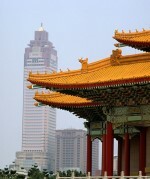 Other top priorities include tightening financial supervision, promoting long-term savings and attracting more tourists. Morocco also needs to address the issues of the agriculture sector’s over-reliance on rainfall, the bureaucracy and corruption that riddle government services, low rates of literacy, poverty and poor infrastructure, as well as inaccessible medical and sanitation facilities in rural areas. Social, foreign relations and economic initiatives taken by the reigning King of Morocco are a positive step forward for the country. The government under the rule of King Mohammed VI has definitely made all the right moves to put the country on the fast track to development. An extensive reform program has been launched to stoke growth. Various initiatives for industrial, agricultural, and infrastructure development are on the anvil. Further, the country has taken several measures to encourage lending to small and medium enterprises (SMEs) and thereby promote entrepreneurship. The country has allocated $206 million to implement the National Pact of Industrial Emergence (PNEI), a plan spread out over six years between 2009 and 2015. The initiative aims to create jobs, bolster economic development and support investors seeking outsourcing and off-shoring. In accordance with the Millennium Development Goals set for 2015 by the World Bank, Morocco has made commendable progress with regard to poverty alleviation, education, and infant mortality reduction. Unlike other countries, the global economic slowdown affected Morocco’s economy but it did not crush it. The country’s consistent performance and steady upward climb has prompted Standard & Poor’s to confer an Investment Grade on Morocco, proof that the country continues to hold its own and march ahead.